Offering you a complete choice of products which include air operated 3 double diaphragm pumps and air operated double diaphragm pumps. We have attained wide reputation in the market by manufacturing and supplying an exclusive range of modern day Air Operated Double Diaphragm Pumps. Specially engineering to be driven with compressed air the offered pumps efficiently render large volume transfers in shorter time. Design of these pumps is free from rotating parts, which makes it ideal for handling variety of fluids. 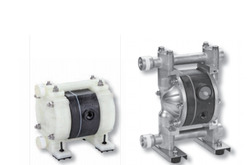 Further, we use finest grade aluminum or polypropylene material to fabricate these pumps which can be ordered from us with Hytrel, Santoprene or Teflon diaphragms at a competitive price.